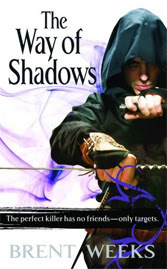 Assassins, secrets, magic, plots & betrayal. Those are the key parts of this book by Brent Weeks. The books was a Christmas present but it's taken me a while to get around to reading it. The story of a young boy with dreams of becoming an assassin who eventually manages to become the apprentice of the very best in the land. They train while the king and various other families with some claims to the throne all scheme and plot against each other. Of course the assassin become part of these plots but also have their own agendas. This was a great book full of twists and turns and unexpected developments. It's not entirely perfect though. While all the parts directly related to the assassins were great there were a few moments where all the feuding families got a little mixed up and I couldn't remember who was with who. That's only a minor flaw though, I still gave it four out of five on Goodreads. The book is the first part of a trilogy and I've now picked up the other two books. I'm looking forward to reading those next. Very good review, as always - well written and nicely balanced.